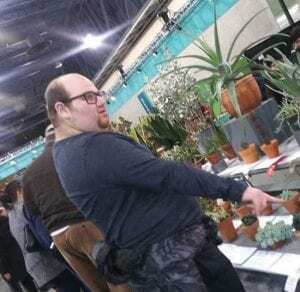 While he’s now made his mark in the horticultural world, Littwin has long been a staple of South Jersey’s Jewish community. A longtime member of the Katz JCC, Littwin has been involved with ACHaD, the JCC’s Special Needs Department, for many years. He’s also connected with the Jewish Abilities Alliance (JAA), which is run through Federation. Every Monday, he can be found in the gym, playing basketball, and on Wednesdays he attends an ACHaD fitness program. Thursdays are his social group and swim. “I like exercising and swimming,” Littwin said. In the summers, he attended the JCC Camps at Medford. The same can be said of the members of Sons of Israel, where Littwin has been active since his early childhood. “I like going to shul,” he said. When he was younger, Littwin had the job of changing the page numbers on the sign at the front of the sanctuary so that all members could follow the service. Since becoming a bar mitzvah, Littwin is regularly invited to the Torah for an aliyah. Though he can’t read Hebrew, he knows the prayers by heart. Also on a different level are some of Littwin’s “splinter skills,” or special abilities, particularly in mathematics and data analysis. He makes extensive calculations instantaneously and finds patterns within information. If you give him your birthdate, Littwin will tell you, within seconds, the day of the week you were born. Littwin represents a unique demographic of young people who were diagnosed with Autism in the late 1990s and early 2000s, who are now Millennials in their late teens and twenties. Many of them can successfully attend college and join the workforce—with the right supports. “I’d like to go to college in the future,” Littwin said.